According to an item in the March 1898 issue of the Pharmaceutical Record, the Arnold Chemical Company was an off-shoot of the John C West Drug Company of Chicago. I can’t find the Arnold Chemical Co. in any of the Chicago directories that I have access to (which aren’t many), but the company was in business as early as the mid – 1890’s. They ran newspaper advertisements from December of 1893 through February of 1899 using 151 S Western Avenue as an address. After 1899, advertisements for Arnold’s continue but the company name and address no longer appear. 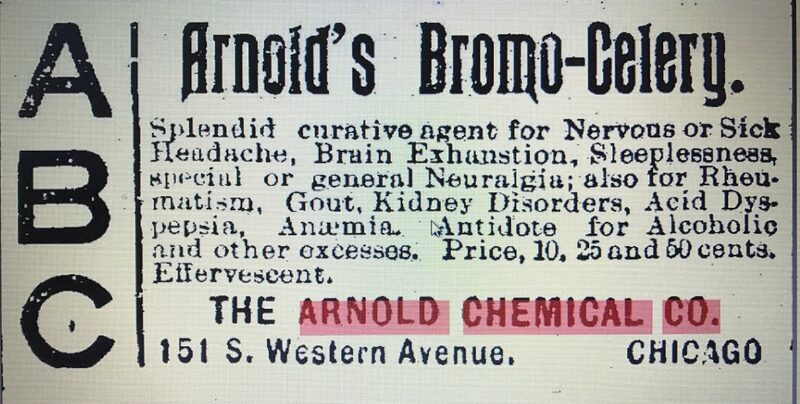 The Arnold Chemical Co.,Limited, surfaced in Toronto, Canada around 1900 so it’s possible they moved from Chicago to Toronto but I haven’t been able to confirm or deny that and I haven’d found any advertisements connecting them to the Bromo Celery Product. 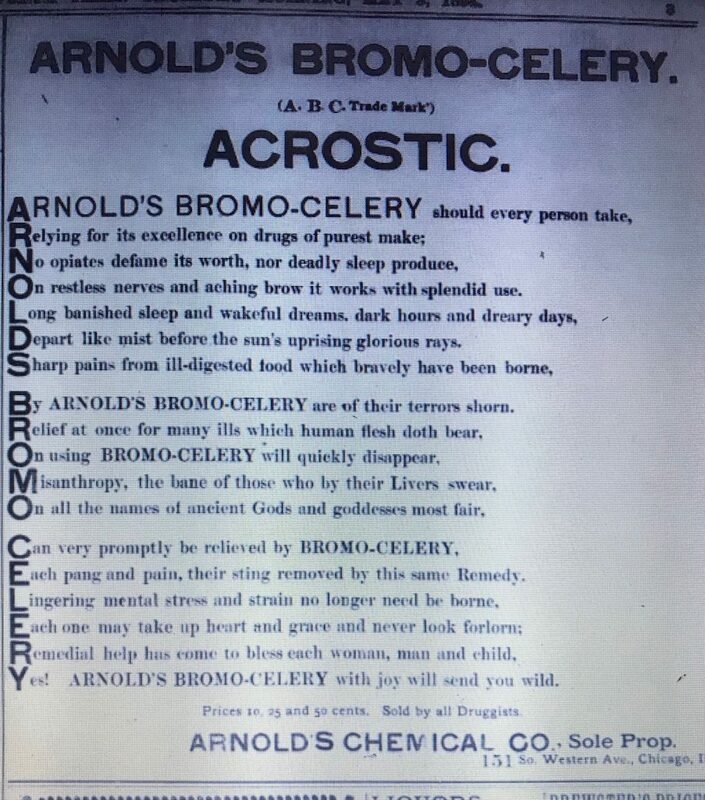 Arnold’s Bromo Celery, manufactured by Burks Medicine Co., Chicago, Ill. is now called Arnold’s Bromo Compound. I’m guessing Burks acquired the rights to manufacture Arnold’s Bromo Celery when the Arnold Chemical Company either dissolved or moved around 1899-1900. The Burks Medicine Company called themselves manufacturers, agents and wholesalers of patent medicines. Burks was listed as a new business enterprise in the April 24, 1884 issue of the Inter Ocean, a Chicago newspaper. The first listing I can find for them is in the 1889 Chicago directory, located at 135 East Lake Street. In 1912, they moved to 115 West Lake Street, where they remained through at least 1917. S.S. Cressler and J.A. Cressler were listed as directors. By 1930 they are no longer listed. Typical advertisements described Bromo Celery as a “splendid curative” for headaches, brain exhaustion, sleeplessness, neuralgia, rheumatism, gout, kidney disorders, dispersion and anemia and as an antidote for alcoholic excesses. One from 1894 called it a refreshing summer drink dispensed at soda fountains or in 10, 25 and 50 cent bottles. This advertisement claimed it cured headaches as well as everything else under the sun. There probably was some truth to the headache claim. A 1911 analysis of the product by the Massachussettes Board of Health reported that it contained acetanilide. While acetaminilide has unacceptable toxic effects on the kidney and liver, it metabolizes in the body to paracetamol (acetaminophin), a common ingredient in over-the-counter pain relievers used today. 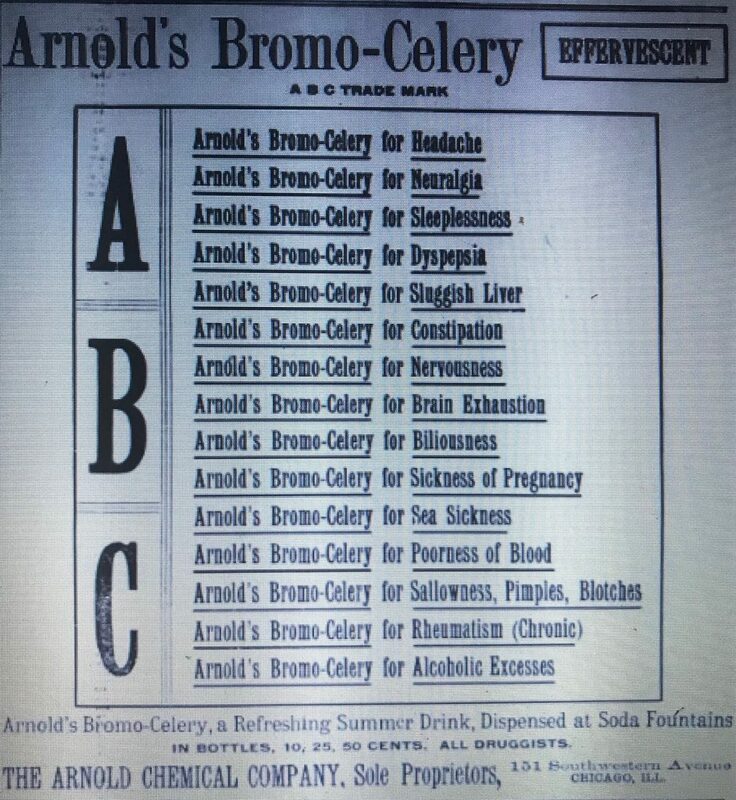 One last advertisement that caught my eye, this one from the May 3, 1894 issue of the Leavenworth Times, was actually an acrostic that spelled out Arnolds Bromo Celery. If you have the headache you must simply pay a dime for the trial bottle as a test. Drink it same as soda water and Bromo Celery will do the rest. Next Next post: Horlick’s Malted Milk, Racine, Wis., U.S.A., London, Eng.